It is September and around here that can only mean one thing for discerning music lovers – the Salford Music Festival. All gigs are free except where marked. Highlight of the opening night is the debut gig of electro wizard The Junta at Wangies. The alter ego of Salford City Radio DJ and Kit B bassist John “Monty” Montague serves up a heady brew of Kraftwerk inspired motorik beats mashed up with a variety of electronica influenced via Depeche Mode, OMD and New Order. The return of Carl Lingard’s Pearl Divers is well worth checking out at the Ashley Brook but the must see combination of the night is the heady brew of Chorley’s Taser Puppets, Salford’s dark wave pioneers Factory Acts, the neo-psych of Weirds and post-punk agit-prop from The Giro-Babies. Also recommended is the very strong line-up at Wangies with Danielle Carter’s Blue Zen kicking things off. 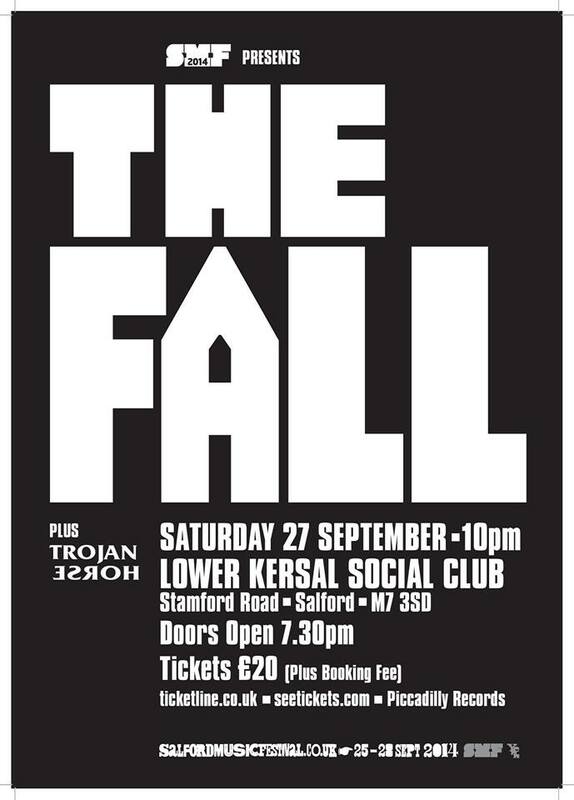 Gig of the day again is The Fall with an all dayer at Lower Kersal Social Club from 3:30pm and the headliners on at 8pm. Guests at this one are still to be announced. Posted on September 14, 2014 September 14, 2014 by HalfEdgeMediaPosted in Gig NewsTagged The Fall.